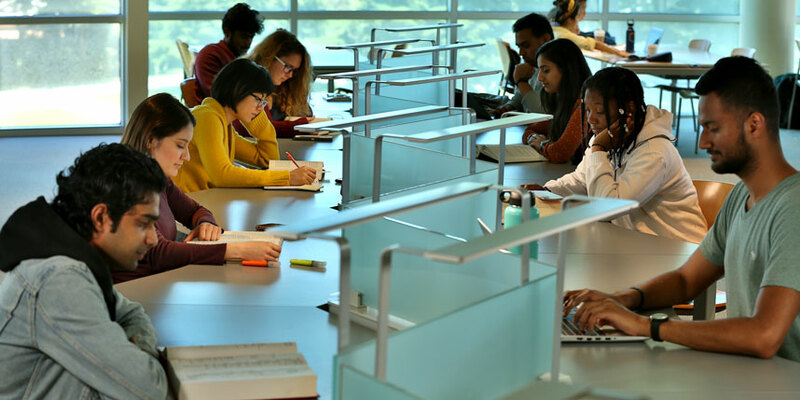 The J. Paul Leonard Library offers collections, services, and facilities designed to contribute to your academic success in a safe and welcoming space. • Connect with fellow students and faculty members over a cup of coffee in the 1st floor Peet’s Coffee & Tea café. • Consult with a library faculty member in person at the Research Assistance desk, using instant messaging, text, or email, or by scheduling a research consultation appointment. • Use desktop computers in the Research Commons (open 24/7 during fall and spring semesters) and Study Commons (open Sun.-Thurs. until 2:00 a.m. during fall and spring semesters). Both spaces also offer quiet study rooms and group study rooms. • Borrow a laptop computer from the Research Commons for use anywhere on campus. • Reserve a group study room to work on group projects with other students in your classes. • Study individually in comfortable, light-filled spaces. • Explore unique materials in the library’s several special collections, view exhibits and displays from the collections, and attend programs featuring speakers. • Use the Digital Media Studio & MakerSpace to create video, multimedia projects, poster prints, and 3 dimensional prints.